Experiencing both positive emotions and meaning is fundamental to human flourishing. The present study aimed to build and expand upon recent attempts to assess prioritizing positivity, which involves habitual ways of incorporating positive emotions in daily life (Catalino et al. 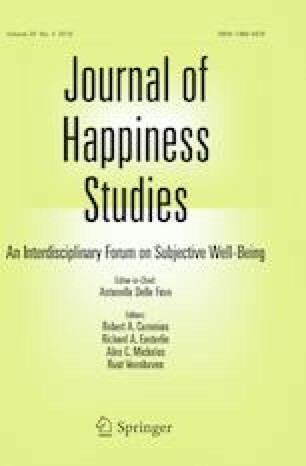 in Emotion 14(6): 1155–1161, 2014), by assessing the prioritization of meaning in daily life and its associations with well-being. Results from two studies, employing adult community samples (N = 107 and N = 251) demonstrated coherent, replicable factor structure and good internal reliability for the 12-item scale of prioritizing meaning. Prioritizing meaning was positively associated with life satisfaction, happiness, positive emotions, sense of coherence, gratitude and presence of meaning, beyond the effect of prioritizing positivity, thus demonstrating the possibility that prioritizing meaning makes a distinctive contribution to well-being. Process mediation models showed that prioritizing meaning is associated with the experience of meaning which in turn mediates the beneficial effects of prioritizing meaning on a variety of well-being indicators. Prioritizing meaning was also directly associated with well-being indicators underscoring its potential role in affecting well-being. Furthermore, prioritizing meaning was found to significantly mediate the effect of search for meaning on all indicators of well-being other than sense of coherence. The findings suggest the importance of prioritizing meaning and hold significant conceptual and practical implications for understanding processes of meaning making and their potential effects on individuals’ well-being. Central Bureau of Statistics. (2015). Statistical abstract of Israel 2015: annual data—2. Population. Resource document. Central Bureau of Statistics. http://www.cbs.gov.il/reader/shnaton/shnatone_new.htm?CYear=2015&Vol=66&CSubject=2. Accessed 1 September 2016.